I didn’t know it was possible to love and loathe something so much simultaneously, but that’s definitely the case when it comes to holiday entertaining. I look forward gathering my friends and family together in my house the minute a slight chill hits the air, but the anxiety builds and builds as I realize that executing holiday parties amid my normal schedule of shuffling my kids around, work, and Christmas shopping. One way to take the stress out of food prep is to make a few key dishes in advance and freeze them until the day of the meal. It requires a little bit of planning, but having frozen dishes ready to be warmed and served is so much easier than trying to execute an entire meal from start to finish all at once. To help you get in the holiday spirit and prepare for company, here are some amazing make ahead dishes for the holidays that all can be prepped and frozen. Some dishes are baked the day of the event, others are just thawed and reheated. It couldn’t be simpler, and you’ll love how everything comes together so easily the day of your party. Spinach Artichoke Dip from Cleverly Inspired – Dips are great for serving a crowd, and having them made in advance is a huge time saver the day of a party. Once it is thawed serve it with chips and chopped vegetables! Reheating instructions: Transfer dip to a microwave-safe bowl and warm in the microwave until dipping consistency is reached. Pure and Simple Crab Cakes from Once a Month Meals – These classic party bites can be made even easier by making them in advance. The day of the party you can warm them up and they’ll taste fresh and creamy, just like the day you made them. Your guests will love them and you’ll love how much time you saved making them in advance. Freezing instructions: Wrap each crab cake individually in plastic wrap. Then place them in a freezer bag and seal tightly. Reheating instructions: Warm oil in a skillet and cook the crab cakes for 3 to 4 minutes per side, or until browned and cooked through. 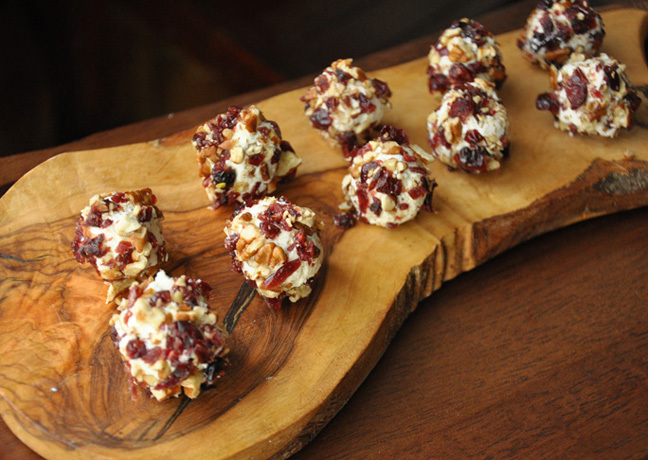 Pecan and Cranberry Goat Cheese Balls from Momtastic – This holiday cheese ball recipe has goat cheese at the base—a perfect cheese for freezing. In fact, even if you aren’t having a holiday party it is nice to have a few of these in your freezer for the season in case you plan a last minute dinner party or are invited to a friend’s house. Freezing instructions: Wrap each ball individually in plastic wrap and an outer layer of aluminum foil. Thawing instructions: Bring to room temperature for 2 hours before the party. Do not place in the oven or microwave. Braised Short Ribs from Big Bear’s Wife – This delicious main course is ideal for serving a crowd at the holidays. You prepare the ribs and marinade in advance and then freeze everything in a freezer bag. The day of your party, transfer the frozen food to a slow-cooker and cook on low for 7 to 9 hours. This gives you plenty of time to do everything else you need to do, and you’ll have a delicious piping hot dinner ready to serve. Freezing instructions: Add the cooked meat and marinade to a freezer bag and seal well. Cooking instructions: Add the frozen contents of the bag to a slow-cooker. Cook for 7 to 9 hours on low heat, or until the ribs are steaming hot and the meat falls off the bone. Turkey Pot Pie from Taste of Home – This terrific make-ahead dish is the best for serving turkey in a new way to your family and friends. It also makes for a cozy dinner if you are celebrating with a small group. Freezing instructions: Wrap the uncooked pot pies in plastic wrap in the pie plates and freeze. Cooking instructions: Remove the pie from the freezer 30 minutes before baking. Preheat the oven to 375 degrees F. Bake for 30 minutes covered, and an additional 15 minutes uncovered. Ham and Cheese Potato Casserole from Real Mom Kitchen – This delicious take on a classic ham dinner for the holidays is perfect. It contains salty holiday ham and everyone’s favorite potatoes in one dish! Freezing instructions: Cover the uncooked casserole with plastic wrap and freeze. Cooking instructions: Remove from the freezer for 30 minutes. Preheat the oven to 375 degrees F. Bake for 40 minutes covered and an additional 15 minutes uncovered. Bacon-Wrapped Beef Tenderloin from Food for My Family – This delicious recipe is ideal for serving a crowd. You prepare the beef by wrapping it in bacon, then freeze it in freezer bags. Taking the time to wrap everything perfectly is such a time saver the day of your event! Freezing instructions: Wrap each prepared medallion individually. Then freeze them all in a freezer bag. Cooking instructions: Bring the beef to room temperature first. Light your grill or grill pan on the stove top and cook the beef for 3 to 4 minutes per side, or until they’re at the desired doneness. Baked Macaroni and Cheese from The Kitchn – This classic main course is perfect for vegetarians, children, and just about everyone. Prepare the whole dish in advance and slip it in the freezer for later! Freezing instructions: Cover the unbaked macaroni and cheese with plastic wrap and freeze. Cooking instructions: Bring to room temperature for 30 minutes before baking. Preheat the oven to 400 degrees F. Bake for 30 minutes, or until bubbly. 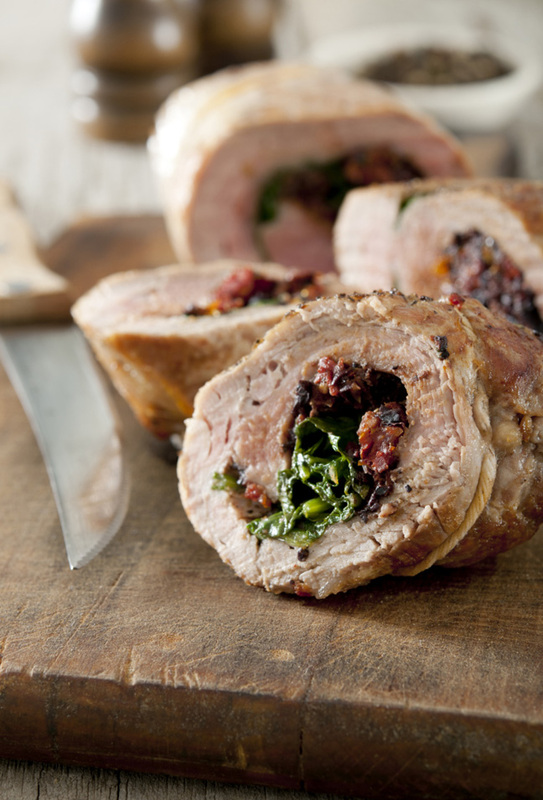 Stuffed Pork Tenderloin from Fav Family Recipes – This delicious tenderloin is ideal for serving a crowd. Prepare it in advance and freeze it until your guests arrive. Freezing instructions: Carefully wrap the stuffed pork in plastic wrap and freeze. Cooking instructions: Thaw the pork for 1 hour before baking. Rub it with the olive oil and spices, and roast according to directions. Cornbread Stuffing from Foodie with Family – This classic stuffing recipe is ideal for a holiday meal. Everyone knows stuffing is the best part! And it is made even better when made in advance. Freezing instructions: Bake the stuffing, then let it cool completely. Wrap tightly with plastic wrap and freeze. Cooking instructions: Bring the stuffing to room temperature. Bake at 350 degrees F covered with foil until the internal temperature reaches 160 degrees F. Remove the foil and bake for 10 more minutes to make the top crisp. Sweet Potato Casserole Recipe from Add a Pinch – This delicious classic recipe is perfect for the holiday season. Save yourself stress on the big day by preparing it all ahead of time so you can just bake it when everyone arrives. Freezing instructions: Prepare the potatoes and let them cool completely. Spread them in a casserole dish, wrap tightly, and freeze. Cooking instructions: Thaw the potatoes and prepare the streusel topping. Then bake at 350 degrees F for 30 minutes. 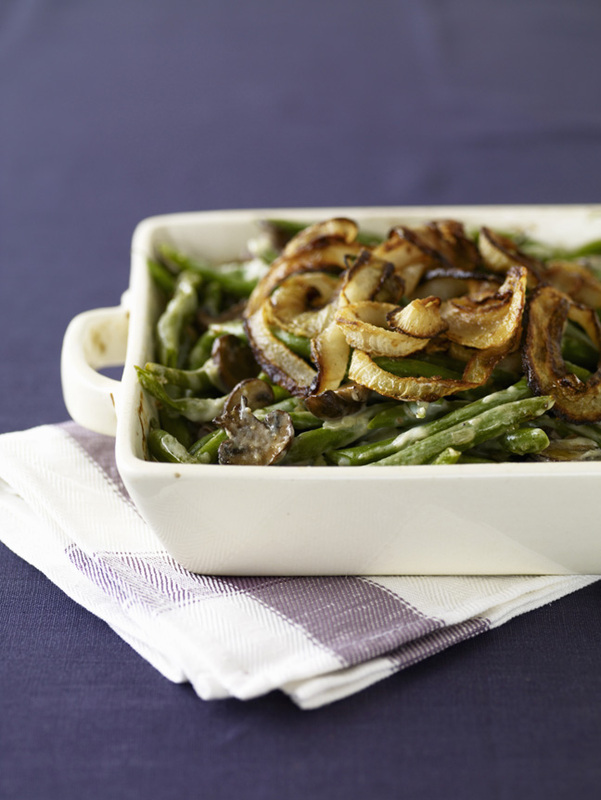 Green Bean Casserole from Mel’s Kitchen Cafe – This classic dish is a must on every table during the holiday season. If you want it but don’t have the time to make it from scratch then don’t worry. This easy method for freezing it is perfect for you. Freezing instructions: Freeze the cooked beans in a casserole dish that has been wrapped in plastic wrap. Freeze the topping in a separate freezer bag. Cooking instructions: Bring the beans to room temperature. Cover the dish with foil and bake at 400 degrees for 1 hour 20 minutes, or until bubbling. Spread the topping over the beans and bake uncovered for an additional 5 minutes. Creamy Mashed Potatoes Recipe from Taste of Home – If you’ve ever been disappointed by the consistency of your mashed potatoes after you’ve reheated them, it’s time to switch up your recipe. This recipe reheats to a creamy, fluffy consistency no matter how far ahead you make them. Freezing instructions: Freeze in 1½ cup portions. Reheating instructions: Thaw in refrigerator. Bake for 30 mins at 350 degrees F.
Turkey Gravy from The Pioneer Woman – Gravy has got to be everyone’s biggest last-minute headaches when it comes to holiday meals. Why wait to make the gravy after the turkey is cooked? Use the neck and bag of giblets that come with your turkey to prep gravy ahead of time and kiss that last-minute headache goodbye. Freezing instructions: Let gravy cool to room temperature, then pour into freezer-safe glass jars. Reheating instructions: Move gravy to the refrigerator the day before serving so it can thaw, then reheat on low heat on the stove until warm. Soft Dinner Rolls from King Arthur Flour – No meal is complete without a big basket of soft dinner rolls. This easy recipe makes it a snap to bake up fresh bread yourself without the hassle of making them from scratch in one day. Freezing instructions: Wrap the unbaked buns tightly in plastic wrap. Cooking instructions: Thaw the dough overnight in the refrigerator. Heat the oven to 350 degrees F. Bake the rolls for 20 to 25 minutes. Brush the tops with melted butter and serve. Frozen Pumpkin Pie Cheesecake from Chelsea’s Messy Apron – This fun take on a classic pumpkin pie is perfect for the holiday season. Even the crust has a delicious cinnamon twist! Freezing instructions: Cover the dish well with plastic wrap and aluminum foil. Thawing instructions: Only allow to soften for about 10 minutes before serving. 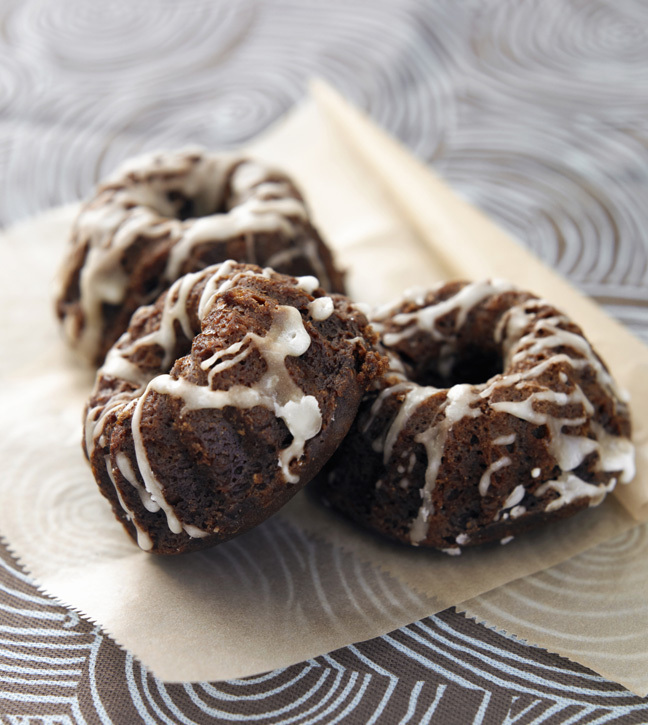 Gingerbread Bundt Cake from Brown Eyed Baker – This delicious cake is a fun take on classic gingerbread. It is also perfect for serving a crowd! Freezing instructions: Wrap the un-iced cake completely in plastic wrap and aluminum foil. Thawing instructions: Bring the cake to room temperature for 2 hours. Then make the icing fresh, ice the cake, and serve. Crumb Topped Apple Pie from An Oregon Cottage – Apple pie is a classic holiday dessert. This one features a unique crumb topping and is ideal for making ahead. Just freeze it unbaked and bake it up fresh when you are ready. Freezing instructions: Cover the pie with plastic wrap and foil. Cooking instructions: Place frozen pie on a cookie sheet and bake at 350 degrees F for 40 minutes. Then remove the foil and bake for an additional 40 minutes, or until bubbly. Snickerdoodle Bars from Averie Cooks – These delicious bars are perfection for the holidays. They are a great take on a classic recipe and can easily be made ahead for any occasion. Freezing instructions: Cover the baked bars tightly with plastic wrap and an outer layer of foil. Thawing instructions: Bring to room temperature before cutting and serving. Boozy Pecan Pie Bars with Salt by Minimalist Baker – These delicious bars are a fun new take on pecan pie. Make them in advance and freeze them uncut until the day of your event! Chocolate Peppermint Ice Cream Roll by Barbara Bakes – This fun holiday dessert is the best kind of sweet for a family meal. It is made in advance and served right from the freezer. Freezing instructions: Cover the roll tightly with plastic wrap and slide into a freezer bag to freeze completely. Thawing instructions: Serve right from the freezer.